If there's at least one thing you can say about Tony Scott's latest film, Unstoppable, is that it's thankfully not as terrible as its bland and uninspiring title suggests. Inspired by the CSX 8888 incident in 2001 (go on Wikipedia it, I'll wait), the movie tells the tale of a runaway train and the two men (Denzel Washington and Chris Pine) who attempt to stop it. There's nothing that quite warms up a wintry afternoon than a Tony Scott film, with its colour saturation always seemingly cranked up to 11. This isn't intended as an insult but an observation of the director's, somewhat, unique style. In keeping with the rest of Scott's films, its pace goes as fast as its 'unstoppable' lifeless antagonist while also giving the characters themselves a chance to breathe occasionally. Being Tony Scott's ideal leading man in most of his films over the last decade, Denzel Washington once again shows off his cinematic pedigree as the streetwise rail veteran, Frank Barnes. Though he's still a brave bit off being over the hill - unlike the nature of his character seemingly - one suspects Mr Washington will become a classier screen presence the older he becomes, in a faint reminiscence to Morgan Freeman. Chris Pine measures up equally as well to his co-star. Having defied audience expectation and pleasing some of the most fickle of sci-fi fans in his role of, the iconic, Cpt. James T Kirk in last year's Star Trek - my third favourite film of 2009 for the record - the young actor once again shrugs off his pretty boy looks and manages to portray a gritty, relatable, working-class hero in the form of train conductor, Will Colson. Though the highly charged set pieces should keep audiences marvelling and on the edge of their seat, the film is undoubtedly carried by Washington and Pine's brilliantly natural and sincere on-screen chemistry. Their somewhat unfortunate and frustrating home-lives is what grounds the film and separates it from the other big and dumb action movies released in recent times, yet for all the shallowness found in his features, this personal tone is something Tony Scott tends to pull off really well. The support cast was littered with, well, support actors. Kevin Dunn and Rosario Dawson added their unappreciated workmanship and class to the feature very well, while Ethan Suplee (of My Name is Earl fame) Lew Temple performed as well as to be expected, which admittedly, wasn't much. If I had to heap any criticism at the film (and frankly I am slightly nip-picking), it would be that it's a fun film, but not a spectacular film, of which I may add to my DVD collection in the years to come. Both the stars and the director have made films much more memorable than this. If I want to watch a Chris Pine film I'd probably stick on Star Trek, similarly if I wanted to watch a Washington/Scott collaboration, Man on Fire would probably get the nod ahead of this feature. 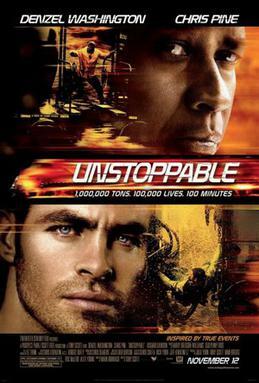 It might not hold in my memory for long, but Unstoppable is still a well paced and ultimately very enjoyable action thriller. Washington and Pine form an unlikely double act of honest working-class heroes, which should warm the heart as well as highly entertain. Very much recommended for all adrenaline junkies out there, even if it's quite unremarkable in places. Unstoppable is in cinemas nationwide from November 26th 2010.
no "see this if you also liked...."? I'm scrapping the "See This If You like..." as I'm clutching at straws for comparisons most of the time. But just for you dear, See this if you like...um...Speed?